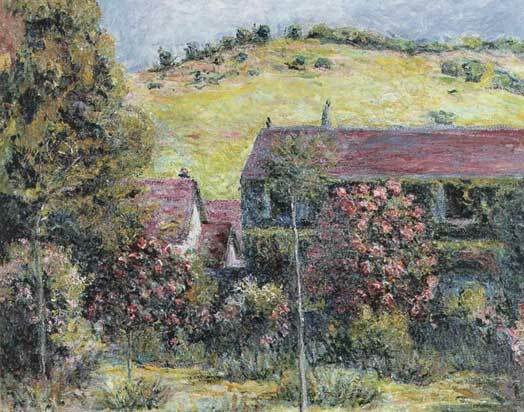 Blanche depicted The House of Claude Monet in Giverny, France in at least eight paintings (1910-1940’s). Claude Monet moved to this house in 1883. 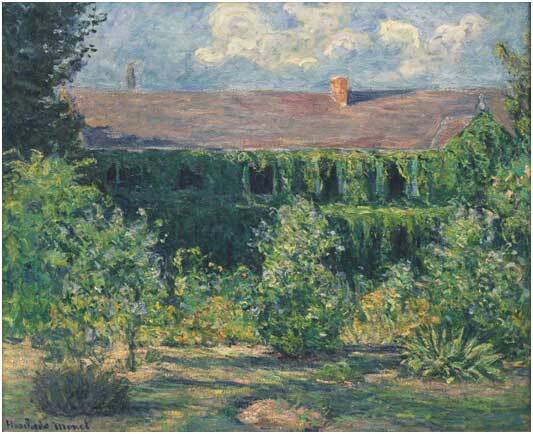 Blanche Hoschedé Monet painted the House and Garden around 1910. 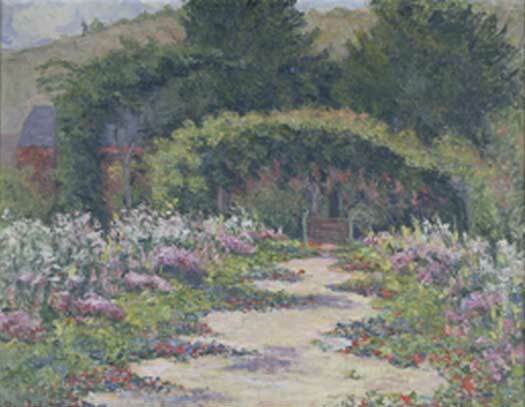 Blanche Hoschedé Monet's painting is a mirror image of the garden designed by Claude Monet. 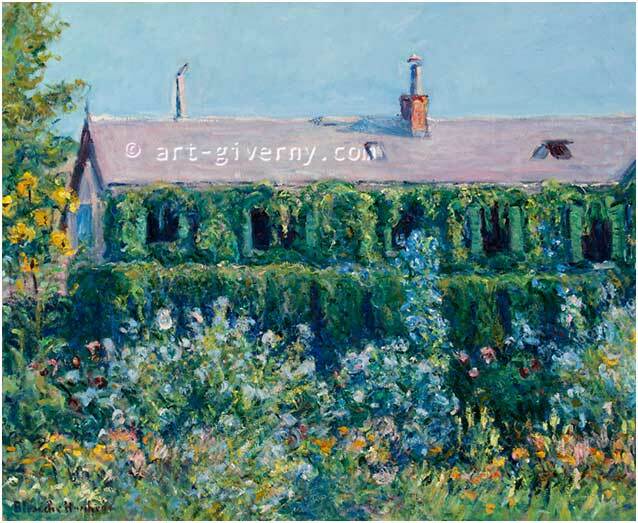 This painting can be compared to a later piece executed by Blanche that belongs to the Museum Poulain in Vernon, France entitled “House of Claude Monet”. Out of all these paintings, this is the one where the daylight floods the floral garden and the House the most. 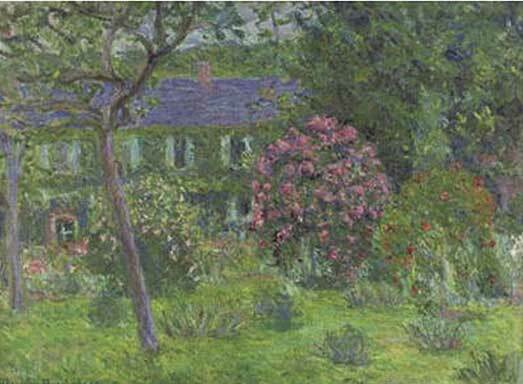 Blanche Monet understood the magical ability of light and its effects on the garden. Blanche does not distance herself from her subject. Here as spectators, we are absorbed, attracted by the flowerbed designed by Claude Monet: a symphony of colors - a vision of blue in agapanthus and golden sunflowers rising up on the left. The interplay of delicate to strong colors of the flower garden and the creeping plants is contrasting with the uniformity of the blue sky. The garden is never static. Above the garden, on the second floor nestled in the left corner we see Claude Monet’s bedroom. The curtains never drawn, Monet will throw open these windows onto the garden and contemplate the sky and its reflection on his artistry below. 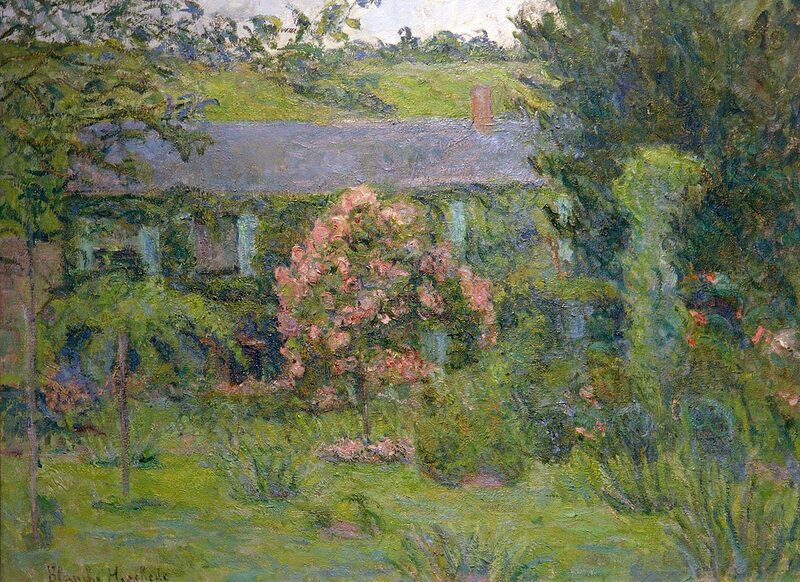 Claude Monet moved in in 1883. The Garden became an experimental vision of creativity in gardening and painting. 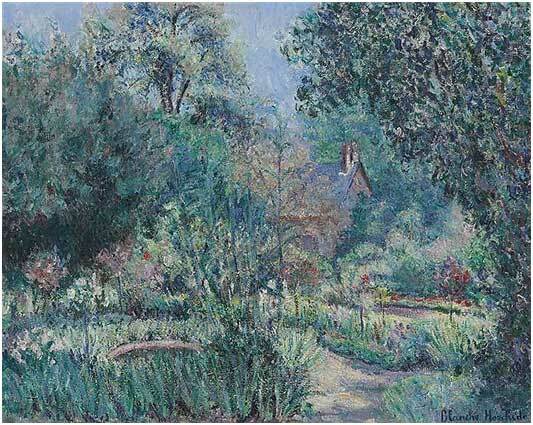 Claude Monet said: “I am good for nothing except painting and gardening”. 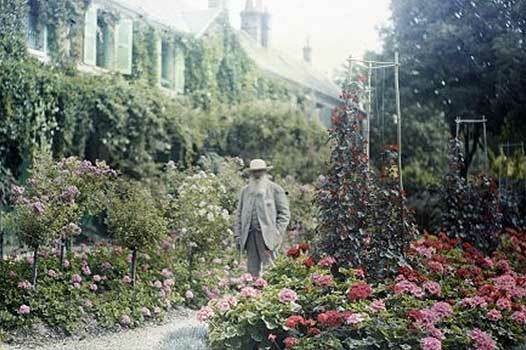 Claude Monet was a master gardener a horticulturist and colorist. Octave Mirabeau said in 1891 about the garden that Claude Monet created: “This is where Claude Monet lives, in this never ending feast for the eyes. It is just the environment one would have imagined for this extraordinary poet of tender light and a veiled shape, for this man who has touched the intangible, expressed the inexpressible, and whose spell over our dreams is the dream that nature so mysteriously enfolds, the dream that so mysteriously permeates the divine light.” In 1892, Claude Monet hired Felix Breuil as the main gardener followed by the hiring of another 5 gardeners. 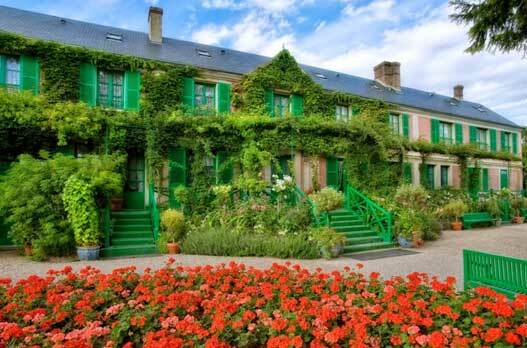 The House of Claude Monet was trellised and overgrown with virginia creeper and clematis. The vines fell back and created a haven of peace where Claude Monet enjoyed summertime - to have his lunch surrounded by friends and family member. 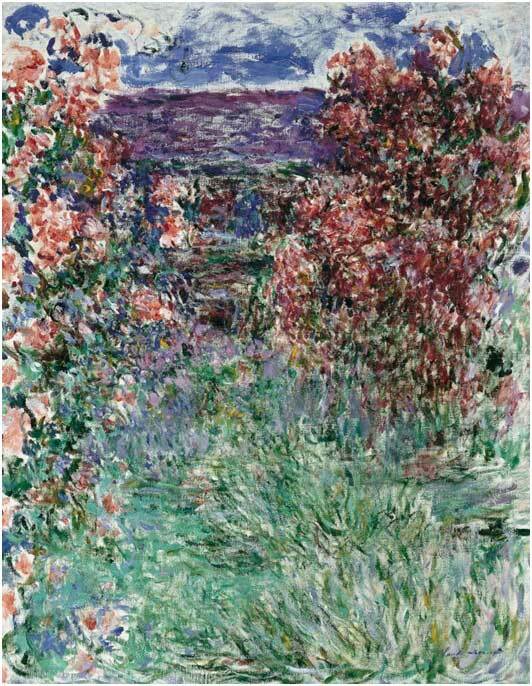 In 1925, Claude Monet did a series of paintings entitled “The House in the Roses”. It is interesting to notice that Blanche Hoschedé painted the same subject but in more detail than Claude Monet.